It is very important to make sure you fill out the UNISA Application Form correctly, otherwise UNISA might not be able to process your application successfully. UNISA gets hundreds of thousands of applications every application period, so you need to get this 100% correct so you are not automatically disqualified. Avoid disappointment by making sure you following our descriptions below. Fill in the UNISA Application Form in online. Please click here to apply online. Contact UNISA either telephonically or by writing them a letter to ask them to send you a UNISA Application form either through the post, or to your email address so that you can print it out and send it back to UNISA through the post. Please click here for the contact details of UNISA. Apply in person by going to your nearest UNISA office, and fill out your UNISA Application Form in person. Please click here for all the UNISA Regional Centres and Offices. Choose a UNISA qualification and make sure you meet the admission requirements. You must apply for admission to UNISA by filling and submitting the admission form. You can either fill in the form online or at a regional office. Once you have submitted your application form + supporting documents and UNISA processes your application you will receive a student number. Remember this student number as you’ll use it for my.unisa.ac.za and further communications with the university. You must thereafter pay a non-refundable application fee. You can pay online via credit card (response is quicker) or via bank deposit. More information on paying the application fee and international payments. UNISA will get back to you to inform you about the outcome of your application. For enquiries regarding applications etc. please contact UNISA. Click here for the UNISA Contact information. Expect the processing of the application to take from three days to a few weeks. Once your application is successful, it is now time to register your modules and start studying! Follow the UNISA registration tutorial in order make sure you register correctly. The UNISA Application process takes place more or less every 6 months. This happens around 6 months before you will be able to study. 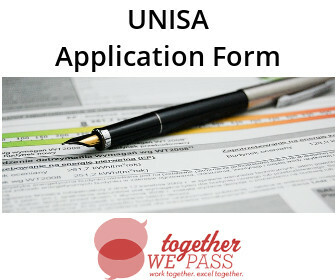 You need to fill in the UNISA application form, and follow all the steps outlined below. First, check the next application dates. When you are ready to apply go to this page: Apply for admission. select which type of course you want to do, and then select “start the process”. Once you are student at UNISA remember that you can always come to back to Together We Pass to get the information and help you need to pass your studies with ease!